As you know, in the personal 3D timeline in which we place our Awareness, our left brains tend to lock us onto a railroad track of cause and effect, time and space … and that’s the track we need to pry ourselves off of whenever we feel less than indomitable. Back into the space of infinite possibilities, which is our true journey through the stars. 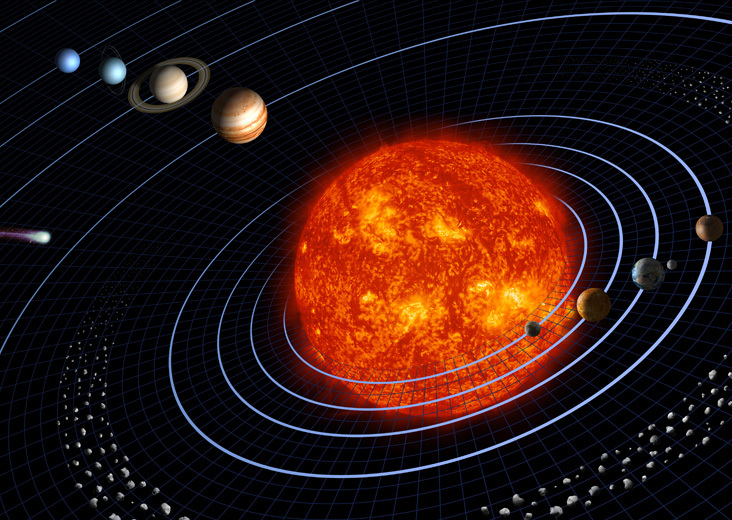 Video: “The Helical Model – Our Solar System Is a Vortex” https://www.youtube.com/watch?v=0jHsq36_NTU .. It is good to keep in mind, though, that the vortical model is only a model in ONE dimension … 3D … of ONE alternate universe. So for the multidimensional reality and the multiverse, the reality is much more complex, and much more intriguing. The same is true of our personal timeline, the one in which our Eternal Soul chooses to place its Awareness at this moment. As we’ve earlier discussed, in every moment of personal choice on the timeline in which we place our Awareness, all other possible choices we might make spin out into alternate realities. At this point in time and space, these alternate realities diverge from our ‘Awareness timeline’. And this happens again and again, from moment to moment. So our Awareness, with possible worlds waiting to be born or chosen, looks a little like the video of the spiraling solar system, multiplied in a hall of mirrors with images of diverging alternate timelines on which we only need to place our Awareness in order to experience the alternate choice. Could be the choice we wished we had made … it’s right there for the experiencing, should we wish it. Could be a traumatic event in this or another lifetime … also right there for the transforming into a less dense reality. Optimization of timelines, as discussed recently (1), is a process of picking, from a higher level of reality, that timeline, among the many that are ours, on which we might best place our Awareness. For me, the best of all possible timelines is the one that benefits all beings of light and love. I say this because … as we’ve all heard about the Butterfly Effect (2) … it’s very clear that my timeline choices combine with the timeline choices of all beings of love and light, and unless they are synchronized in the best interests of all, my teammates in higher dimensions can’t fully optimize my own timelines. Personally, I’m drawn to do this Hathor Timeline Optimization mostly once a day, and sometimes several times in a day. I find my timelines don’t need much adjusting these days, but it’s fun to remember that my Team and I share this wonderful gift and can use it whenever we like to fashion my Awareness and expression in the dimension of time. In addition to timelines (might that be the role of light in Creation? ), we have also dimensions to consider (might that be, the role of love in Creation?). Dimensions are all around us and within us, yet our Awareness is often placed on only one or two at a time. Lately, for instance, I’ve been experiencing 3D and 4D at the same time. 4D is a ‘finer’ vibration than 3D. Speedier maybe. Possibly higher pitched. It allows much faster flow of thought, feelings, and images, for instance. Through both dimensions, clearing and lightening of density has been taking place as the incoming light improves the vibration of Planet Earth. It has been a bumpy ride. It used to be that I’d notice a bump ‘up’ for a few days, maybe a week or a month, when I gloriously felt the incoming energies, and the unfolding of my so-long-hidden potential as a multidimensional being. THEN a down dip would begin, down into the subconscious mind of the Human Collective on Planet Earth, and I would begin to feel lost and hopeless. It’s been a little like a sine wave event: At the high point of the wave, an experience of superconsciousness. Then, a slide down into normal consciousness. Then, down into the abyss of the subconscious mind. Each time my Awareness reaches down into the subconscious, it throws light on something previously darkened by lack of Awareness. So, like the solar system speeding through the galaxy, my Awareness is constantly changing, brightening, expanding. In the last week or so. during this Divine gift of the December 25th-29th, 2014, gateway, it seems to me that the peaks and troughs are happening very very quickly, like the waves at the bottom of the above graph. Sometimes, when I’m down in a trough, I get the feeling that I’ve taken a wrong turn, that I’ve made some tragic choice that separates me forever from love and light. What a silly notion! When the very feeling I’m experiencing is the one I’m resolving into love and light. But I do get that feeling from time to time, and every time I must transform despair to hope, darkness to light, fear to love. Each time I transform, I say to myself: Say, I remember, I was there before … down in the trough … and the resolution, the transformation, the upturn, happened just like that! Why did I forget? More discombobulating things have been happening. When I rest prone, I’m getting little physical jerks and repositionings of various parts of my body. For a matter of months, I was totally mystified by this. Just last night I began to interpret these as jumping back and forth between personal timeliness. And sometimes I feel it as two timelines touching, old hurts healing and resolving as the two blend or merge into ONE lighter, brighter, more joyful timeline. For me, it’s important to keep in mind, the immensity of the current undertaking, the transition of our Solar System, of many Star Systems, of this entire Universe to a different frequency. It’s important for me to keep in mind that God … Source … the Divine places this change in motion. Else, how could it occur? Yet, the Divine is an excellent Delegator. There’s a vast Angelic Realm to help us. And the realm of the Ascended Masters. And the many realms of our Star Brothers and Sisters. Help abounds. So when the ride is down, I always ask up. PS: This picture of a harmonic waveform reminds me of how timelines can be dispersed into longer and shorter time intervals then join together as an experience of Now. To me this seems true for me personally, and for my interactions with other Souls. There is another good picture of harmonic waveforms in PhotoBucket: http://s202.photobucket.com/user/shoobnsheeb/media/caching%202012/harmonic_waveforms_zps0395f3c9.jpg.html#/user/shoobnsheeb/media/caching%202012/harmonic_waveforms_zps0395f3c9.jpg.html?&_suid=1419610728985044709109120273826 ..
(1) See LInk: “Activations to Heal the Lightbody by Timeline Jumping” … by the Hathors, through Alice B. Clagett, https://wp.me/p2Rkym-2mz ..
(2) Butterfly effect. The chaotic motion mentioned in the video is really a very careful orchestration of many timelines and many many dimensions. But from our 3D perspective, it appears to be without predictive quality … chaotic. Video: “Chaos Theory / Butterfly Effect” https://www.youtube.com/watch?v=HfD1OsP-Bv8 .. It is like those experiments with the photons … do you remember? … where the photons were perceived to have ‘a mind of their own’ … they kept disappearing, and reappearing, and playing tricks on the researchers. From which I derive: photons are love and light and joy. Impossible to predict, but easy to experience, if only we will step out of the logical mind, and into the infinite sphere of possibilities! This entry was posted in 09 – Monadic aspect (Awareness), 15 – Multiverse (4 universes), A - My Favorites, Activations of light, Astrogeophysics - EMF - hologram, Awareness timeline, Chaos theory - butterfly effect, Dimensional optimization, Dimensions - multidimensionality - veils, Hathors (see also 'All - Law of One - Ra'), Rambles through the brambles, Timeline merges and splits, Timeline optimization, Timeline transformation, Timelines - multitemporality - alternate universes - fractals, ZZ- Awakening with Planet Earth and tagged Awareness timeline, butterfly effect, chaos theory, Dimensional optimization, higher dimensional help, incoming light, multidimensionality, multiverse, my favorites, solar system, Teams, Timeline optimization, timelines, Timelines - multitemporality - alternate universes - fractals, transforming dimensions, transforming timelines, Venus, ZZ- Awakening with Planet Earth on 26 December 2014 by Alice B. Clagett.